Hide is a utility to make your desktop clean. With a click of a button you can go from a cluttered desktop with tons of windows to nothing. And to bring those pages back up again just click another button. 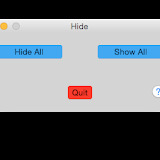 Download Hide for Mac for FREE below! New check for updates page that auto checks for you. Removed button click sound for a better user experience. Support for app updates via AppFresh. Please update to the latest version of Hide here. We have fixed icon colors so it will no longer appear as it is missing. When you downloaded the app it was placed in your downloads. It will not show up in Launchpad because it is not in your apps folder. To add to all you need to do is drag the icon to the applications folder. Go back to Launchpad and you will see the icon. To do this we recommend using an app deleting utility called AppCleaner. If you install that app you can search for “Hide” and click delete. If you don’t have that app you can go to “Applications” in Finder. Find Hide and right click. Then click delete. First, you need to download it by clicking the link above. Then, drag the icon to “Applications” in Finder. There will be a pop-up asking if you want to “Keep Both”, “Replace”, or “Stop”. Click replace and the app will be updated. First, you want to download the zip file on your Mac by clicking the button above. One everything is done installing you will want to double click the zip file to unzip it. The Hide icon will appear. Then you want to drag it to the applications folder so it will be in your Launchpad. If you are opening it for the first time it may ask if you if you are sure you want to open the app because it’s from an unidentified developer. Click Open.